As if Cook's bogus "97% climate consensus" paper didn't already have enough problems including use of political activists who desired a specific outcome as the raters, Shub Niggurath tweeted the graph below derived from Cook's hidden database showing these CAGW political activists had wide disagreements of up to 65% between what the abstracts allegedly claimed about AGW. Thus, even rabid CAGW political activist "scientists" have wide disagreements about what the scientific literature allegedly says about AGW and the degree of man's contribution. There is no consensus, much less the Cooked up fraudulent claim of 97%.
.@hockeyschtick1 Exactly. Only volunteers who rated large no. of abstracts showed good agreement. Due to high no. of neutral abstracts. Maybe that's because 99.7% of 11,944 climate science papers did not say recent global warming was mostly man-made [Legates et al 2014]. Only 41 of the 11,944 abstracts supported that assertion. Thus, even CAGW political activist "scientists" widely disagree on what the scientific literature allegedly claims regarding climate. 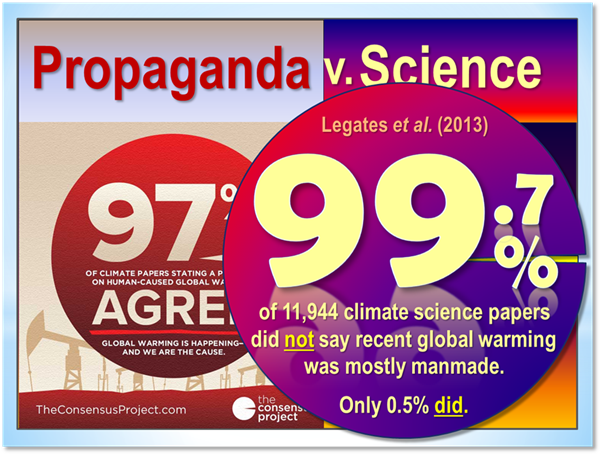 There is no consensus on a consensus, much less a 97% consensus Cooked up as political propaganda. Oh wait, there is a 100% consensus however.